This sculpture depicts the collective memory throughout time of our human and tribal histories, our legacy as evolving conscious beings. We humans are a unique creation with the ability for self-knowledge and self-determination, compelled to participate in the remembrance of our own unique origin, our own soul’s journey. This monument emphasizes how, through myriad incarnations, the essence of creation is carried forth and laid down again and again, like waves upon the ocean of time. Through countless lineages and personal identities we are surrendered to the great mystery. In glimpsing the pattern of creation, we find we are polishing ourselves into the brilliance of “Source”, as we become aware of our eternal connection. 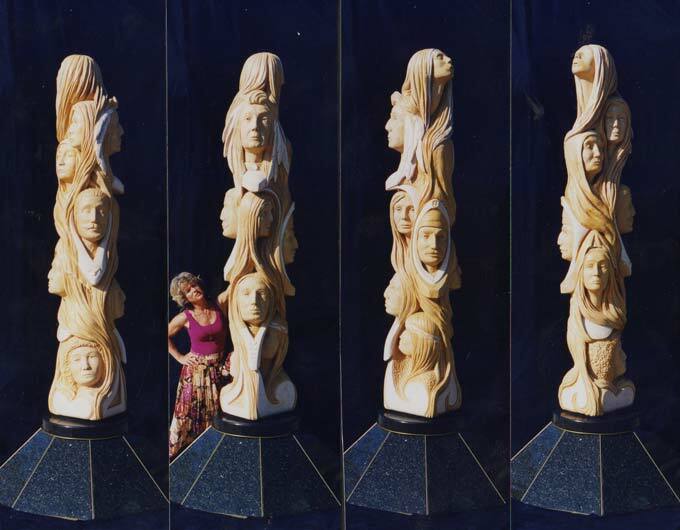 Through waves of undulating hair, the concept of “Time” is conveyed by the sculptor, an animation of the great mother, Gaia Mater. Held within her flowing tresses are the faces of the ancestors, each afloat in the fabric of creation, as we tap into her we tap into the journey of humanity with all its experiences. This is the great wheel of time and of life unfolding, where success is not considered by outer criteria, but only by the value of the lessons learned, whether pleasant and sweet or filled with pain and contradiction. It is when the mortal coil is finally sloughed, nothing material endures, only the immaterial gifts of wisdom, compassion and knowledge remain as the birthright of our soul’s journeying. It is our thirsting for life that pulls us back again and again into form, until, through our process of evolving, greater awareness is gained. Through “The Totem” our human story is both remembered and honored as “living history”, passed on perpetually from one generation to the next.